Do you enjoy being challenged and inspired by stories that are written in such a way as to evoke deep emotion, and bring new ideas to light? When stories closely reflect snapshots of life, they often speak to our hearts – especially if the emotion woven into the story reminds us of our own struggles, or disappointments, or joys. Today, one of the often-overlooked modes of storytelling is poetry, which the dictionary defines as ‘a literary work in which special intensity is given to the expression of feelings and ideas by the use of distinctive style and rhythm’. Doesn’t this sound like a treasure trove for readers in search of deeper meanings and messages? And yet many avid readers steer away from poetry, thinking it too difficult and abstract to understand, and perhaps too boring to be enjoyed. Certainly this was the category I fell into, until I read a book entitled Bleeding Heart, a debut collaboration by Elizabeth Rawls and her mother, Rachel Rawls. 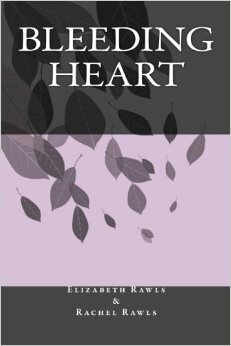 Published in 2014, Bleeding Heart is a collection of poems, short stories and riddles written with a Christian view of life at the core. Bleeding Heart is comprised of four sections, with three by Elizabeth – Poems, Short Stories and Riddles – and one by Rachel, which includes a selection of various poetry including the humorous ‘hump day’ works. Naturally each composition in the volume holds a different theme. A few of the various messages include: the beautiful uses of imagination; a sorrowful comparison between poverty and the wastefulness of wealth; the meanings of dreams; the importance of God’s guidance in our ‘quest’ of life; the sorrow of losing and grieving for a loved one; and many more. While I cannot pretend to be an expert at analyzing or evaluating poetry, I do know that many of the selections contained in Bleeding Heart spoke to my heart, and touched my imagination in ways that prose seems incapable of. Each poem is a heartfelt, miniature story, with lovely rhythm that in most cases flows smoothly, like a spoken song carrying vivid depictions of life and fantasy. As for the three short stories – one of my favorite portions of the book – each one also holds to a poetic rhythm while brimming with emotion and meaning. Additionally, a fun bonus to the volume is found in a surprising collection of six riddles. They are not easy… They tickle your brain… And they are fun! If you are new to poetry like me, Bleeding Heart is a collection likely to spark a new interest in an ancient literary method of storytelling. The Preface, where each author discusses portions of the ‘stories behind the stories’, provides invaluable help, hints and guidance to begin uncovering the layers and ideas of the poetry. On the other hand, experienced poetry-readers are certain to find the emotion woven into each work inspiring, as well as touching. Naturally not every poem or story is likely to resonate with every reader. Some portions may feel too dark and dismal, or the rhythm may not move as easily into one imagination as it does another. Possibly the poems were written at different stages of the author’s life, as varying levels of fluency and vividness are apparent. Overall, however, Bleeding Heart is a beautiful work that is, without any fragment of doubt, written straight from the hearts of Elizabeth and Rachel Rawls. Their talents and gifted ability to convey emotion and inspiration through words are clearly the result of walking in tune with our Lord. And Bleeding Heart is the beautiful result. Note: I received this book from the author, free of charge, in exchange for my honest review. Thanks to Elizabeth Rawls for sending me a copy! A collection of heartfelt and intriguing poems, short stories and riddles broadening your view on life and dealing in a wide range of topics: faith and hope, the realm of fantasy and imagination, dreams, silliness, and the hardships of life. If you feel like reading something short with a strong message behind it to get you through the day, browse a wide variety of poem titles. If you want funny, the “hump day” poems will make you laugh! If you want to delve into something more, a story that touches your heart and makes you think, there are short stories to peruse. If you want to challenge your mind, the riddles are like a fun puzzle for all ages to enjoy! Everything you need can be found here in this inspiring and thought-provoking collection! My inspirations for “Bleeding Heart”: Each poem and each short story in this collection is like a little story with its own inspiration, which I share more about in the preface of this book. Many of the settings were inspired by my time living in Italy and traveling across Europe, settings such as long-forgotten castle ruins and mist-shrouded Medieval cemeteries. One poem is a sad “goodbye” for the day I had to leave and come back to America, leaving the life I once had and people behind. Life in general has also been an inspiration, what I’ve learned about human nature, and life’s emotional and physical struggles. Never to give up, but to persevere. What has inspired me most, however, is the way in which God has worked in my life. He is the only way I live and thrive, and I hope to share what I have learned of faith and perseverance with readers. I also have a section of fun and difficult riddles. The idea was first inspired years ago when I read “the Hobbit”: Golem asked Bilbo a series of riddles, and that grew in me a fascination for them! I started writing my own, and would give them as “little presents” to my mother every year on her birthday. I placed the best ones in this book, along with a few lovely poems my mother wrote. This entry was posted in Book Reviews, Inspirational Poetry and tagged Bleeding Heart, Elizabeth Rawls, Inspirational, Poetry, Rachel Rawls, Riddles, Short Stories. Bookmark the permalink. Prairie Sky Book’s amazing Review of my book: “Bleeding Heart”! Amazing review from one amazing book reviewer! Thank you so much, rawlse, for your very kind remarks. Of course I meant every word of my review – ‘Bleeding Heart’ is a beautiful book that inspires with every page. 🙂 Thank YOU for the opportunity to review it!